Like many women I love chocolate but I am not a chocolate snob. Now don’t get me wrong, I do like Organic Fairtrade Dark Chocolate made from 80% cocoa solids but that is hardly the stuff of lazy sofa bound indulgence is it? No. Give me a good old, blue collar, Curly Wurly any day. Sadly, there are times when my cupboards just don’t seem to cooperate and I have to improvise. While a Curly Wurly is cheaper and offers only 1 portion – ergo guilt free – some improvisations can be put together without having to leave the house and track down a late night petrol station just for a bar of chocolate. 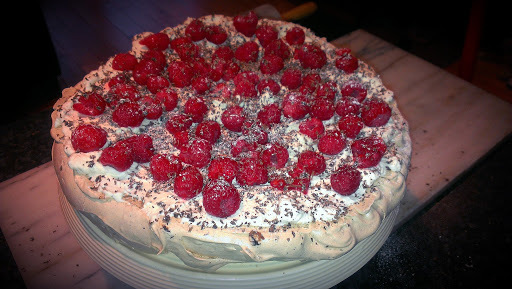 Recently, inspired (again) by the Domestic Goddess herself, I succumbed to my late night chocolate cravings by way of a Chocolate & Raspberry Pavlova. I must admit, I’ve always had something of a Pavlova nonchalance. It just never really excited me as a pudding. I am not even a fan of raspberries (its their little bumps & seeds). 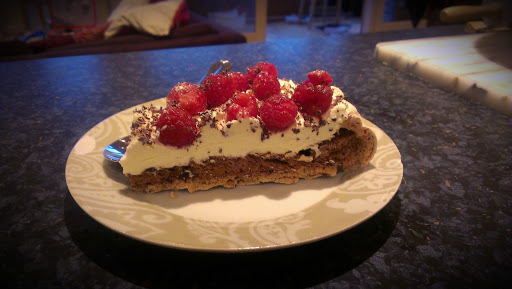 However, this bad boy with its gooey marshmallow filling & molten nuggets of chocolate chips, smooth cream and tart berries has changed all that. Try it & share the love. Now, there are a 4 things one oughta know before attempting the Pav. Its a heck of a lot easier IF using some form of electric whisk. Otherwise I just wouldn’t attempt it. Provided the egg whites are beaten stiffly it cant go wrong. And there is an easy way to check this: hold the bowl over your head (or over the sink if you prefer). If the whipped egg whites stay in the bowl its fine & the Pav will turn out great. Perhaps err on the side of caution & tilt the bowl sideways rather than lose your hard work down the sink if they are not whipped enough. The rule = 1 egg white + 50g caster sugar. If I don’t have the required amount of egg whites as a recipe states I can still make a Pavlova by remembering this rule & changing the amount of sugar I add. It will be a smaller Pav but this is not a bad thing when I’m only feeding 2. Egg whites can freeze! Granted the freezer starts to resemble a sperm bank after a while. I stash egg whites in freezer bags & defrost the night before I need them. Just remember to label how many egg whites are in the bag. I only changed a couple things from the original recipe because at the time I didn’t have the exact quantities to hand (egg whites, cocoa powder) but to be honest, I like how it turned out so I wouldn’t change it back. Who says late night cravings are only for pregnant women? Cut out a sheet of greaseproof paper to fit a baking sheet & lie a dinner plate upside down on top of the paper. Trace around it using a pen then turn the baking sheet upside down so the drawn circle shows through. Use this template as a guide for the Pavlova later. 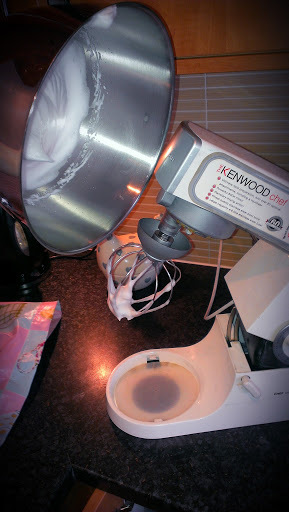 Using a held-held or free-standing mixer and a scrupulous clean bowl (any grease can affect how the whites will stiffen) whisk the egg whites until they form stiff peaks. To be certain, hold the bowl upside down (or for the less adventurous) tilt the bowl to one side. If the egg whites hold & don’t move, they are ready. If not, continue beating for a while longer & check again. Checking the egg whites are stiff enough. With the motor still running add the sugar 1 tbsp at a time until its all added. Continue to beat until the egg whites become glossy. 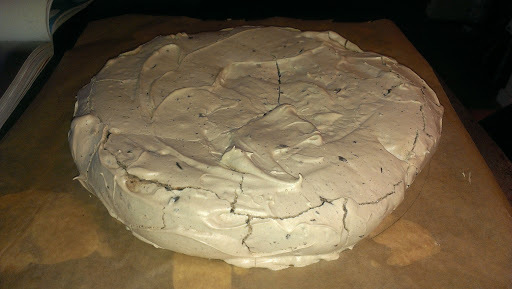 If you take a little of the meringue between thumb & finger & rub it will feel a little grainy. Continue whisking until it feels smooth when you do this. Glossy & smooth after all the sugar has been added. Finely chop the chocolate into small pieces (smaller than chocolate chips). Add these along with the sieved cocoa powder & vinegar to the egg whites. Using a large spoon or spatula, gently fold everything into the egg whites until its incorporated. Folding is essentially making an angled circle motion with the spoon, where you bring the contents from the bottom of the bowl up to the top. Using the whisk I dot a little of the meringue mix onto the baking sheet & place the greaseproof paper on top. This secures it during baking. 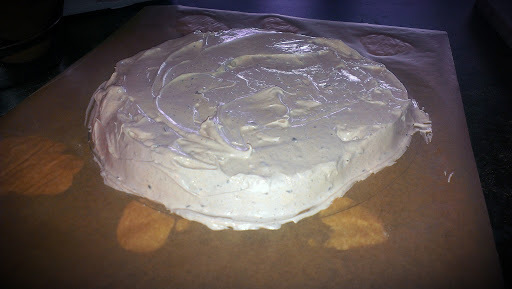 Pile the meringue mixture onto the paper & using a butter knife spread & smooth it into a circle then smooth the top. Pile the meringue onto the baking sheet using the circle as a template. Place in the oven & immediately turn the temperature down to 150C. Cook for 1hour 15mins. Once done, turn off the oven & open the door slightly. Leave it in the oven to cool completely. Cooked, cooled & cracked Pavlova: It will always crack when it cools. When ready to serve, invert the Pavlova onto a serving dish or cake stand so the bottom is now the top and gently peel away the greaseproof paper. 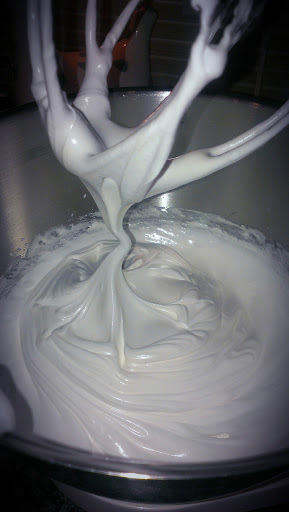 Whisk the cream until soft peaks form then pile on top of the meringue, smoothing it to the edge. Toss the raspberries on top & using the large holes in the grater (the one normally used for cheese) grate some dark chocolate over the top. Serve in thick slices.This would serve 8-10 but is so incredibly light (and tasty) I would probably prepare for 2 slices per person. Dinner Party Pudding or Midnight Feast? There isn’t much I would change with this recipe, I think Nigella hit the nail on the head perfectly. However I would experiment with the vinegar. I know it might sound bizarre that vinegar is added. I don’t pretend to understand the alchemy, but the vinegar helps it become a chewy marshmallowey Pavlova, rather than a crunchy meringue. 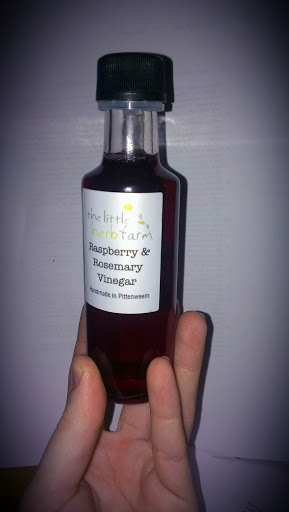 The Little Herb Farm’s fruit & herb vinegars.